In 2013, America’s agricultural hemp industry had been nonexistent for more than three decades. That changed with the stroke of a pen in 2014. Hemp was reintroduced into the agriculture life of the U.S. after President Obama signed the Agricultural Act of 2014, also known as the 2014 Farm Bill. Hemp has been sweeping the nation since that day. Though hemp is still considered a Controlled Substance because of its relationship to its cousin marijuana, American farmers and researchers now have the opportunity to begin tapping into its incredible potential. We, at Pure Hemp Botanicals, are thrilled by how quickly the community of hemp growers is growing and how much hempmania is spreading. 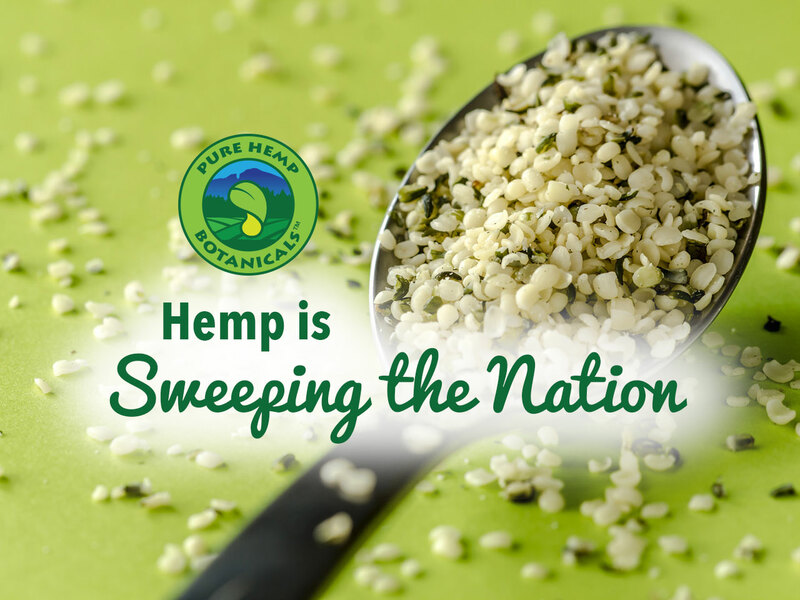 It is amazing how much our domestic hemp industry in the U.S. is growing despite obstacles created by both the Drug Enforcement Administration (DEA) and the Food & Drug Administration (FDA). Colorado hemp farmers along with Colorado’s Department of Agriculture are paving the way for hemp to become a cornerstone of America’s agriculture again according to a recent article in The Greeley Tribune. The state of Colorado’s support of hemp cultivation is allowing hemp farmers to be innovative and quickly expand their operations. Duane Sinning, who works in the hemp division at the Colorado Department of Agriculture, shared with The Greeley Tribute that the number of acres of hemp planted in the state increased from 200 to approximately 2,000 between 2014 and 2015. This year, the Colorado Cultivators—one of the state’s largest hemp operators—projects that they alone will plant 1,500 to 2,500 acres. Colorado Department of Agriculture is in the process of establishing a robust certified hemp seed program similar to those it has for other major crops. It is because of Colorado’s healthy hemp culture that it was able to host the world’s largest hemp expo, NoCo Hemp Expo. At the beginning of this month, NoCo Hemp Expo was held at The Ranch in Loveland, Colorado. Pure Hemp Botanicals was honored to be one of the sponsors and participants of this year’s event. It is incredible how much this event has grown since last year. The organizer, Morris Beegle, shared with The Greeley Tribune that the venue itself was three times larger than the venue for last year’s event. Even at such a large venue, all of the vendor spots sold out. People came from all over the country and the world for this event. Along with testifying to Colorado’s incredible hemp industry, the success of the NoCo Hemp Expo is an indicator of how much attitudes about hemp are changing. We believe that hempmania is only going to continue to grow as more people learn about hemp. From the positive environmental impact of cultivating hemp and the amazing ways this plant can be used to all of the health benefits of incorporating hemp into your diet, there is a lot to love about this plant. If the Industrial Hemp Farming Act is passed, hemp farmers will face fewer obstacles since it will decriminalize hemp on a national level. Until it is passed, we will continue to celebrate all of the states who join Colorado in passing their own hemp legislation.